Hello and welcome to another brown lens review! I really enjoy reviewing contact lenses because I wear them on a daily basis and have been doing so for over a decade. This pair is called Bunny Color Brown and is from the Korean site K-Lenspop. 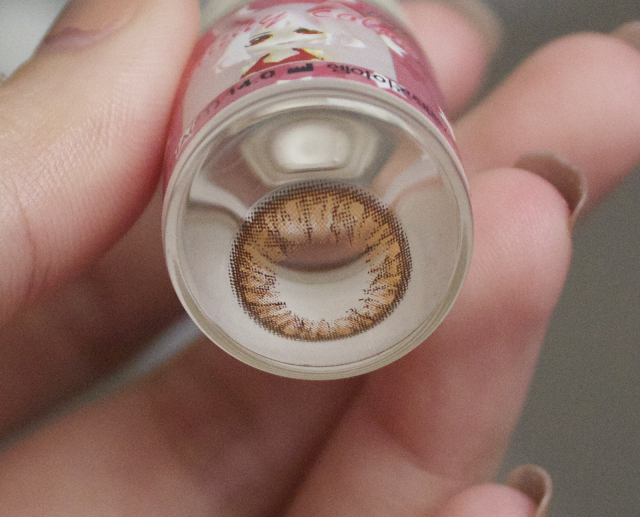 They have a huge range of circle lenses and you can find any kind of lenses there. It's a very natural looking brown and is very comfortable so I'm very happy with them. The lenses came in a cute pop art themed box with a case and tweezers along with an informative guide on how to wear and look after contact lenses. This is really useful for people who are new to wearing lenses as it has tips for lens wear and care . This is what they look like before you wear them. And voila, look at the difference after I wear them! So natural yet prominently brown. Theses lenses are two-toned with a mix of dark brown on the limbal ring and a lighter shade which leans more towards a dark honey-brown. I love how the color is perfect for my complexion and looks natural yet noticeable. They also have a dolly effect along with slight enlargement which makes my eyes look bigger. I can also vouch for their comfort factor because I wore them for over 10 hours yesterday (which I do not recommend) but faced no discomfort at all. Overall, I really love these and recommend them to anyone looking for a beautiful brown color. The best part is that they look good on people with dark eyes just as well as they suit ones with light eyes. These are so so gorgeous! I absolutely love that colour. oh i love wearing lenses too..you look great in them..
Vampire chic honey! That color looks superFAB on you! Thank you for the blog visit babe, hope to see you back sometime! Those lenses look amazing on you! Happy Weekend! Looking beautiful, June dear. Lips are poppin for sure!! Ha!